The Chicago Bar Association has released its 2012 Green Guide to Judicial Candidates (click here for the complete .pdf report). The candidate declined to participate in the Judicial Evaluation Committee (JEC) screening process and, therefore, according to The Chicago Bar Association’s governing resolution for the JEC, is automatically found NOT RECOMMENDED. Judge Rodney Hughes Brooks is “Not Recommended” for retention as a Circuit Court Judge. Judge Brooks was admitted to practice law in Illinois in 1980 and has served as a judge since 1994. Judge Brooks has a pleasant demeanor, but does not possess the requisite knowledge of the law and judicial ability to effectively manage a court call. Judge Brooks has made no attempt to improve his knowledge of the law and judicial ability and should not be retained. Judge Gloria Chevere is “Not Recommended” for retention as a Circuit Court Judge. Judge Chevere was admitted to practice law in Illinois in 1981. The candidate was elected in 2006 and is assigned to various First Municipal Felony courtrooms. Reports from attorneys describe the candidate as punctual with adequate legal knowledge and that she runs an efficient courtroom. Nevertheless, the candidate is found not recommended due to her unwillingness to conform to attendance policies established for all judges. This comes after she was the subject of a highly publicized news report about leaving her courtroom assignment early. Judge Loretta Eadie-Daniels is “Not Recommended” for retention as a Circuit Court Judge. Judge Eadie-Daniels was admitted to practice law in Illinois in 1977 and served in the legal departments of the Chicago Transit Authority and the Chicago Housing Authority. In addition, Judge Eadie-Daniels served as an Assistant Cook County State’s Attorney from 1989-2000 before her election to the Circuit Court in 2000. Judge Eadie-Daniels is currently assigned to the Sixth Municipal District in Markham. Judge Eadie-Daniels’ “Not Recommended” finding is the result of continuing concerns about the judge’s temperament and knowledge of the law. Judge Lisa Ruble Murphy is “Not Recommended” for retention as a Circuit Court Judge. Judge Murphy was admitted to practice law in Illinois in 1984 and has served as a judge since 1994. Judge Murphy has been in the Domestic Relations Division since 1995. Judge Murphy has been an Individual Calendar Domestic Relations Judge since 1997. The judge is experienced and knowledgeable in the field of domestic relations. Concerns about diligence, work ethic, and considerable delays in issuing written decisions resulted in a “Not Recommended” finding. In the post below, I reported that the Chicago Council of Lawyers had found seven of 58 Cook County judges running for retention this year "Not Qualified" to remain in office. However, the Council also singled out nine other judges as being "Well Qualified" for retention and, in this post, we look at what the Council had to say about each of these. 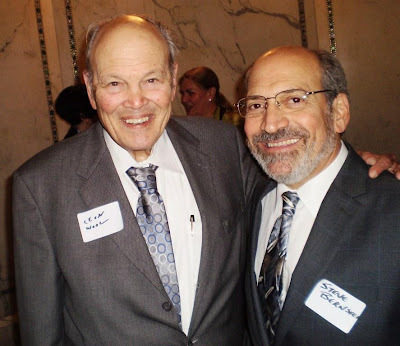 Prior to becoming a judge, Moshe Jacobius was with the Illinois Attorney General’s Office for his entire career. Judge Jacobius was appointed to the Circuit Court in 1991. He was first assigned to the Domestic Relations Division and then to the Chancery Division. In 2000, he was made Presiding Judge of the Domestic Relations Division, and presently serves as Presiding Judge of the Chancery Division. Respondents report that Judge Jacobius knows the law and works hard. He is considered diligent by the vast majority of respondents. His courtroom is described as efficient and fair. Judge Jacobius is characterized as generally prepared for court with a good memory for his cases. He is called dignified and professional. As presiding judge, Judge Jacobius handles the administration of the Chancery Division and hears motions and cases assigned to him. Respondents were complimentary and frequently remarked upon his honesty, integrity and knowledge of rules. Judge Jacobius is highly regarded by attorneys and judges in both Domestic Relations and Chancery divisions. He is praised as a supervisor and as a mentor. The Council finds him Well Qualified for retention. Prior to becoming a judge, Stuart Lubin was a career Assistant Cook County Public Defender. 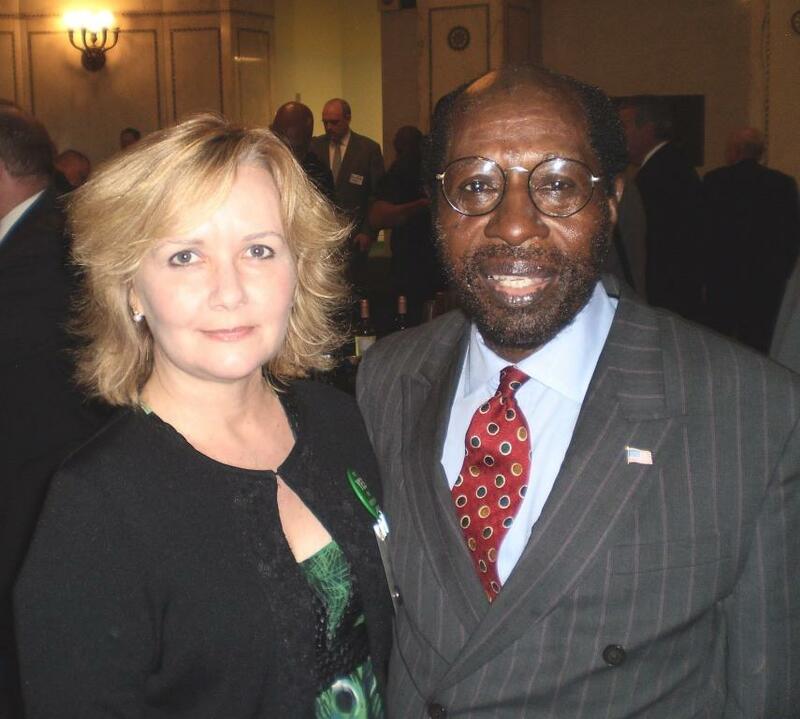 Judge Lubin was appointed to the Circuit Court in 1991 and elected in 1994. He currently serves in the Juvenile Justice Division. reported to always be in control of his courtroom. Respondents characterize Judge Lubin as a model judge and consider him an asset to the judiciary. The Council finds him Well Qualified for retention. Prior to becoming a judge, Stuart Palmer was an Assistant Cook County State’s Attorney and served in the Felony Trial Division. Judge Palmer was elected to the Circuit Court in 1994. He was assigned to the Criminal Division until 2005 when he was transferred to the Chancery Division. Judge Palmer was assigned to the Appellate Court of Illinois by the Illinois Supreme Court effective January 6, 2012. He is seeking retention as a Circuit Judge. ability and a judicial temperament. The Council finds him Well Qualified for retention. Prior to becoming a judge, Martin S. Agran served as an Assistant Cook County State’s Attorney and was in private practice. He was also a panel attorney with the Federal Defender’s Office for 14 years. He was appointed to the Circuit Court in 1994 and elected to the bench the same year. Judge Agran was initially assigned to the First Municipal District, then to the Child Protection Division. He served in the Juvenile Justice Division and the Trial Section of the Law Division. Since 2004, Judge Agran has been in the Chancery Division. This judge was also consistently praised for courtroom management skills. While he “keeps his call moving” and is “very organized,” Judge Agran is also said to be “very accommodating” and grants continuances when necessary. One interviewee pointed out that Judge Agran “always made sure everyone knew the status.” The attorneys interviewed uniformly stated that he “reads everything,” and is always “very prepared” for court proceedings. Many respondents also mentioned that he had an excellent memory and could often recall many details of the matters before him. The Council finds Judge Agran Well Qualified for retention. Prior to becoming a judge, Maureen Connors was in private practice, and also served as an assistant general attorney at the Chicago Park District. Judge Connors was appointed to the Illinois Appellate Court in 2010. She became an Associate Judge in 1988 and was elected to the Circuit Court in 1994. She served in the Traffic Division, Domestic Violence Division, the Probate Division, and the Fifth Municipal District of the Circuit Court. Judge Connors is considered an excellent, hardworking judge. She is considered to have very good legal ability and temperament. She is praised for her knowledge of the law. Attorneys report that she is “exemplary in terms of dealing with people” and “courteous and respectful to all equally.” The Council finds her Well Qualified for retention. Prior to becoming a judge, Marya Nega was the Principal Assistant Attorney with the Metropolitan Water Reclamation District of Greater Chicago. Judge Nega was elected to the Circuit Court in 1994. She was initially assigned to the First Municipal District. In 1995, Judge Nega was assigned to the Domestic Relations Division where she is currently a preliminary judge handling Calendar E.
Respondents describe Judge Nega’s legal ability as excellent, with many interviewees stating that she has a very “in depth knowledge” of the statutes in Domestic Relations. Several respondents also remarked very favorably regarding Judge Nega’s “common sense approach” to applying the law. She is known to describe her rulings logically. The interviewees also believed she does an excellent job managing her courtroom. Several mentioned that Judge Nega always started on time and had a system in place to ensure that all cases were heard in a timely manner. One interviewee stated that “she will skip lunch if it’s a really busy day” in order to get through her call. Judge Nega was also repeatedly praised for her diligence and attention to detail. Several respondents stated that she always reads everything prior to the hearing and that she is “always fully engaged.” One interviewee stated that “she had a memory like a steel trap,” and “always knows what is going on.” Many attorneys remarked that Judge Nega was also very organized. Judge Nega’s temperament and fairness received particularly high praise from almost all of the respondents. The Council finds her Well Qualified for retention. Prior to becoming a judge, Peter Flynn was in private practice, focusing on complex business litigation. Judge Flynn was appointed to the Circuit Court in 1999 and elected in 2000. Judge Flynn was initially assigned to the First Municipal District and then to the Law Division, Individual Commercial Calendar. He currently sits in the Chancery Division. Judge Flynn’s intelligence and engagement with the issues before him are reported as obvious strengths by respondents. Many respondents remarked on how familiar with the cases on his docket the judge is, noting that he is prepared and runs an efficient, professional courtroom. Although respondents indicate that Judge Flynn expects similar rigor from the attorneys practicing in his courtroom, they note he does not lose his temper with unprepared attorneys, but he will pass their cases to another date. Judge Flynn is considered very smart with an excellent legal ability. Several respondents characterized him as among the smartest or best judges in the county. He is described as having a thorough understanding of both law and procedure, as well as having control of his cases. Additionally, Judge Flynn is noted to be engaged and interested in the proceedings before him and possesses good communication skills. “Calm” and “fair” are common assessments of his courtroom demeanor. His courtroom is regularly described as a “level playing field.” It appears that attorneys know what to expect in Judge Flynn’s courtroom and that pro se litigants are handled respectfully and fairly. Respondents believed that cases move through his docket expeditiously. The Council finds him Well Qualified for retention. Prior to becoming a judge, Michael Howlett clerked in the Federal District Court in Chicago and in the Seventh Circuit Court of Appeals. He worked for the U.S. Attorney’s Office before entering private practice. He also served as counsel to Cook County State’s Attorney Richard Devine. Judge Howlett served as an Associate Judge from 1983-86 and was appointed to the Circuit Court in 2005. He was elected to the bench in 2006, spending two years in the Juvenile Justice Division before moving into the Criminal Division. He currently sits in the Second Municipal District, hearing felony cases from the Criminal Division of the Circuit Court. Attorneys praised Judge Howlett in all categories, including his legal ability, courtroom management skills, preparedness and diligence, integrity, temperament, and fairness. He is “upto speed” on his cases and “isn’t afraid to ask questions.” He is also reported to “listen and stay focused,” remain “engaged” in the proceedings, and he “mak[es] sure everyone understands what’s going on in his courtroom. Judge Howlett is reported to be hard working and focused on the cases in front of him: he “cares about people and doing a good job.” Respondents noted that he is well-prepared for his call and well-versed in the law, rules and procedure. Attorneys roundly praised his tone, judicial demeanor, diligence and integrity. Many attorneys focused on his integrity, temperament and fairness, giving him high marks in these areas. Respondents feel he has a good tone and demeanor while on the bench. Judge Howlett is described as “courteous and respectful” and lawyers repeatedly echoed the sentiment that “both sides get a fair shake” in front of him. He was uniformly praised for his fairness, judicial independence, and for being a “professional, a dignified man who is fair and respectful.” The Council finds him Well Qualified for retention. Prior to becoming a judge, Grace Dickler a legal aid attorney and was in private practice as a solo practitioner. Judge Dickler was appointed as an Associate Judge in 1988 and elected to the Circuit Court in 2006. She served in the Second Municipal District. In 2010, she became Presiding Judge in the Domestic Violence Division, and transferred to the position of Presiding Judge of the Domestic Relations Division in 2011. Respondents were largely positive with regard to Judge Dickler. They describe her as decisive with good temperament. She is considered to have very good legal ability. Judge Dickler is reported to be both a good judge and a good administrator. In her current role as the Presiding Judge of the Domestic Relations Division, she has assembled a series of task forces to advise her on reform efforts. For example, she spearheaded a reportedly successful program through which lawyers volunteer to do emergency orders of protection for indigent persons. She is engaged and serious in her duties both as a judge on the bench and as a presiding judge interested in reform. 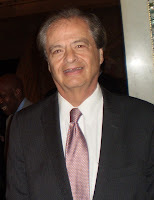 Judge Dickler is considered an asset to the court system. The Council finds her Well Qualified. The Council's complete report may be accessed through its website (VoteForJudges.org) or by clicking on this link. The Chicago Council of Lawyers has released its ratings for Cook County judges seeking retention in the November 2012 election. The Council's complete report is available through its website (VoteForJudges.org) or by clicking here (.pdf document). The Council finds most of the 58 judges seeking retention to be at least "Qualified" to continue in their posts. Nine were singled out by the Council as "Well Qualified" for retention. Seven other judges were identified by the Council as "Not Qualified." Prior to becoming a judge, Kathy Flanagan was in private practice. Judge Flanagan was elected to the Circuit Court in 1988. She was initially assigned to the Domestic Relations Division as a trial judge. Judge Flanagan currently sits in the Law Division on a motion call. However, a substantial number of respondents had a negative impression of Judge Flanagan’s judicial temperament. She was called “hostile,” “imperious,” “rude” and “discourteous.” She was frequently described as impatient or inflexible. A number of attorneys believe these qualities negatively affected her ability to manage her courtroom efficiently. However, even some respondents who were highly critical of her temper noted that she is “bright” and “truly cares” about the outcomes in her courtroom. Responses indicate that Judge Flanagan is clearly diligent and capable on the bench. She is prepared for court, punctual and engaged in the proceedings with a reputation for intelligence and general fairness. However, responses show that Judge Flanagan displays inappropriate temper and has created a courtroom atmosphere that is readily described as hostile or unpleasant. In 2006 the Council found Judge Flanagan Not Qualified for retention for these same reasons. There reportedly has been no significant improvement. The Council finds her Not Qualified for retention. Prior to becoming a judge, Cynthia Brim was an Assistant Illinois Attorney General. Judge Brim was elected to the Circuit Court in 1994 and initially assigned to the First Municipal District. Judge Brim is presently assigned to the Fifth Municipal District but has been suspended from duty since March 12, 2012. Judge Brim was arrested on March 10, 2012 on misdemeanor charges related to an altercation with a Cook County Sheriff’s Deputy at the Daley Center. Most respondents indicated a lack of confidence in her legal abilities. Even though the judge hears generally non-complex matters, her rulings are often described as unpredictable and delayed. Respondents indicate that they regularly file motions for substitution of judge, despite the cost and inconvenience to their clients. Additionally, there are many complaints that Judge Brim is late to take the bench. Attorneys report repeated continuances because court starts late and because the call is handled inefficiently. Attorneys feel that Judge Brim is particularly rude and unaccommodating of counsel who are on call in multiple courtrooms. Many attorneys described her as “consistently late” and there is some concern that her case management delays resolution of cases. The consistently negative reports about Judge Brim’s judicial performance and her arrest at the courthouse at the Daley Center in downtown Chicago raise serious questions about whether she can remain effective on the bench. The Council finds her Not Qualified for retention. Prior to becoming a judge, Christopher Donnelly spent one year in private practice before working as an Assistant Cook County State’s Attorney. Judge Donnelly was elected to the Circuit Court in 1994. He served in the Juvenile Justice Division prior to being transferred to the Sixth Municipal District in Markham, where he currently sits. Most attorneys agree that Judge Donnelly has the aptitude to understand the law and apply it. Attorneys reported that Judge Donnelly is “a smart man,” intelligent,” and has “an excellent grasp of what’s going on in his courtroom.” Regarding his courtroom management, interviewees repeatedly praised his efficiency, describing him as running a tight ship and being capable of moving the call along. His judicial diligence and preparedness were not generally questioned. Many respondents had negative responses about Judge Donnelly’s judicial fairness, with most attorneys reporting that he has an unabashedly pro-prosecution perspective. Another attorney suggested that Judge Donnelly’s experience as a former prosecutor weighs heavily on his current role as a judge. One interviewee who summed up many concerns in moderate terms hoped that the evaluation process would inspire the Judge to consider the impression his demeanor makes. The Council finds him Not Qualified for retention. Prior to becoming a judge, James Egan was both an Assistant Cook County Public Defender and an Assistant Cook County State’s Attorney. Judge Egan was appointed as an Associate Judge in 1989 and became a Circuit Court judge in 1995. He was first elected in 2000. He was initially assigned to the First Municipal Traffic Court and subsequently transferred to the Second Municipal District Criminal Court and the Criminal Division. He currently hears a motion calendar in the Law Division. Respondents had a high opinion of Judge Egan’s legal ability, his diligence and his fairness. Comments with regard to the Judge’s diligence are good, calling him “prompt and alert,” “very diligent,” and “cordial, prompt and familiar with matters he must address.” Likewise, he is described as “well versed in the law and . . . very fair in his application of the law.” Respondents also felt Judge Egan’s courtroom management is excellent, noting that he never wastes time and maintains a courteous professional manner while moving cases through his courtroom. Attorneys seem comfortable in his courtroom, considering Judge Egan to be calm and even tempered. Prior to becoming a judge, Joyce M. Murphy Gorman worked with the Office of the Presiding Judge of the Sixth Municipal District in Markham for four years. Judge Murphy Gorman then worked as a sole practitioner for one year immediately before being elected to the bench. Judge Murphy Gorman was elected to the Circuit Court in 2000. She was initially assigned to the First Municipal District’s Traffic Court. In 2002, Judge Murphy Gorman was assigned to the Civil Trial Section, non-jury call where she presently presides. Judge Murphy Gorman was described by most respondents as knowledgeable about the law. Attorneys say she takes the time to understand the issues and respondents reported that she keeps current on developments in the law relevant to the cases heard in her courtroom. There were several respondents who praised her for using her courtroom mediators effectively. The judge is described as punctual and prepared for court and she issues her rulings in a prompt, timely manner. She is considered fair and independent. Judge Murphy Gorman’s courtroom management skills were given generally favorable marks. Several interviewees stated that she always started her call on time and did not “dilly dally.” Others mentioned how she worked to accommodate attorneys with multiple cases in order to keep the call moving. However, many respondents believed that Judge Murphy Gorman needs to improve her judicial temperament. Comments included: “could be calmer;” “she can be short with people;” “she lets lawyers get under her skin;” “she is short and testy with people in her courtroom.” The Council found Judge Murphy Gorman Not Qualified for retention in 2006 due primarily to reported problems with her temperament. We continue to hear these complaints. On balance, the Council finds her Not Qualified for retention. Judge Hill-Veal failed to submit materials for evaluation. The Council finds her Not Recommended for the Circuit Court. Prior to becoming a judge, Gloria Chevere was a partner at the general practice firm of Ogden & Chevere. From 1987 to 1991, Judge Chevere was Senior Executive Deputy Director for the Chicago Transit Authority. Then from 1991 until 2006, she was a prosecutor and hearing officer for the Secretary of State, as well as a hearing officer for the Metropolitan Water Reclamation District. She was elected to the Circuit Court in 2006, and was assigned to the First Municipal District. In May 2010, Fox Chicago News in conjunction with the Better Government Association, investigated whether Cook County Judges were leaving work early. The article mentioned Judge Chevere as a judge who often left the courthouse early. Judge Chevere was reassigned shortly after the story was made public. Judge Chevere generally received good scores from most attorneys for being able to “move her call.” One respondent stated that he had “seen hundreds in her courtroom” and that Judge Chevere was “still able to keep on top of things.” Many interviewees also believed they were treated fairly in her courtroom. Her legal ability is generally considered adequate for her call and attorneys believe she runs her courtroom efficiently. However, she is reported to be sometimes "dismissive and rude" on the bench. She reportedly is often unprepared -- many respondents believe she has not read pleadings sufficiently before ruling. She has the reputation of unilaterally cancelling her 2:30 pm call, saying that it is not necessary. There were many negative comments about her performance as a judge, primarily related to temperament and diligence. Several respondents believe the judge unnecessarily issues arrests warrants for defendants who are late to court, which wastes resources. About half of the respondents also complained that her rulings are erratic, which some attributed to her being too often unprepared. The Council finds her Not Qualified for retention. Tickets are $100 each. Contact information about the event is shown in the invite, above. Alvarez's Republican opponent in the November election is Chicago attorney Lori Yokoyama. The Illinois State Bar Association has posted brief explanations for all ratings it has issued for Cook County judicial candidates, both for open seats and in the retention election. These explanations are available to the public on the ISBA website in a .pdf format. In retention races, the ISBA found 53 of the 58 retention candidates "qualified" for retention. Five were found "not qualified." The ISBA's comments about each of these retention candidates follow below. Hon. 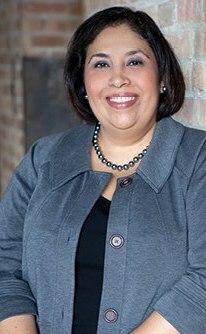 Cynthia Brim was elected to the Circuit Court of Cook County in 1994. She was retained for six-year terms in 2000 and 2006. She was in the 6th Municipal District presiding over Misdemeanor, Traffic Civil, Paternity, Child Support, Custody, Visitation, Domestic Violence, Bond hearings, and Ordinance Violation cases. Other previous judicial assignments include the Domestic Relations Division, the 1st Municipal District, and the 5th Municipal District. Hon. Cynthia Brim has currently been removed from all judicial duties by Special Order No. 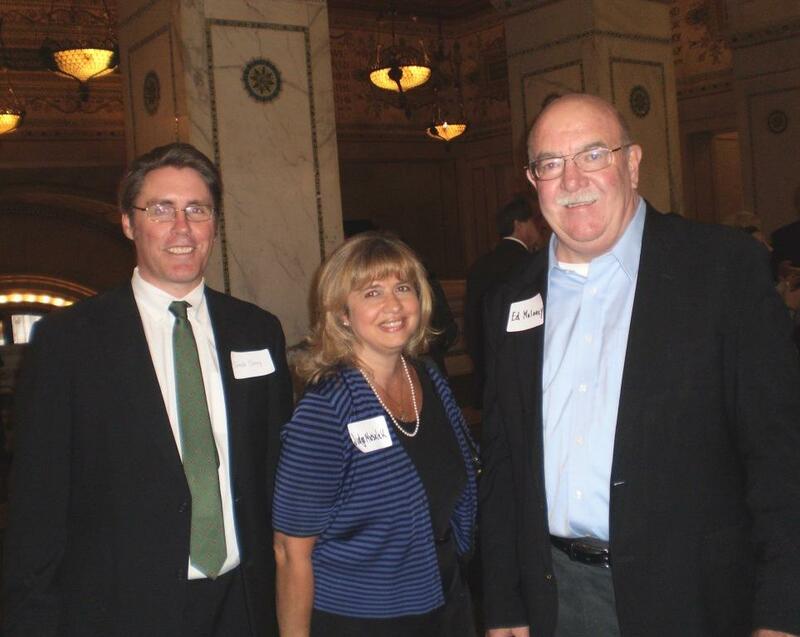 2012-14 of the Executive Committee of the Circuit Court of Cook County. The Committee evaluation questioned Judge Brim’s legal knowledge and ability. For the 2012 General Election, the Illinois State Bar Association determined Hon. Cynthia Brim is not qualified for retention as a judge of the Circuit Court of Cook County. Hon. Gloria Chevere is currently assigned as a “swing judge” in various branches within the 1st Municipal District. She ran unopposed for a vacancy in the 6th Subcircuit in 2006 and was assigned to hear misdemeanor and felony ordinance offenses. The Committee evaluation raised concerns over Judge Chevere’s diligence, legal knowledge and ability. For the 2012 General Election, the Illinois State Bar Association determined Hon. 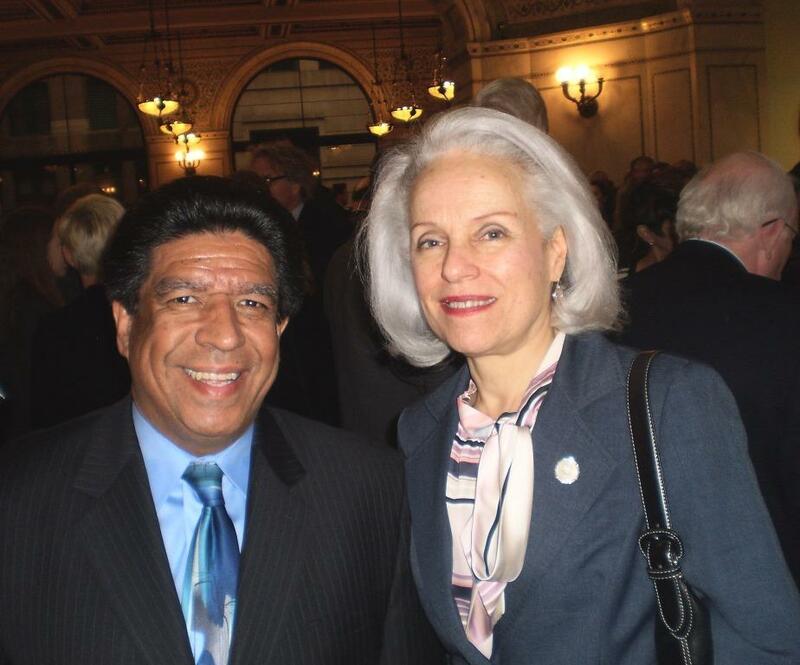 Gloria Chevere is not qualified for retention as a judge of the Circuit Court of Cook County. Hon. Christopher Donnelly is currently assigned to the 6th Municipal District, hearing traffic and misdemeanor cases. Prior to serving the 6th Municipal District, Judge Donnelly was assigned to the Juvenile Justice Division. In 1994, he was elected to the Circuit Court of Cook County. Judge Donnelly was retained for six-year terms in 2000 and 2006. Judge Donnelly’s litigation and professional experience along with his legal knowledge and ability are considered adequate. The Committee evaluation, however, revealed that there are concerns regarding his poor judicial temperament. In addition, Judge Donnelly failed to fully participate in the evaluation process by not completing the evaluation materials and refusing to answer questions posed during his interview. 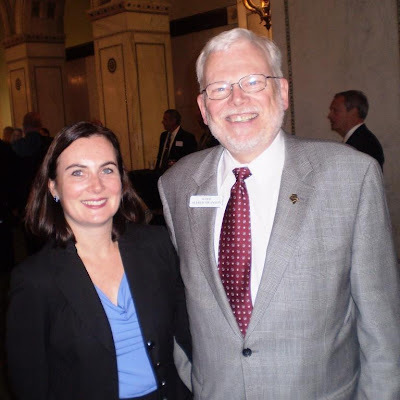 Therefore, in accordance with its guidelines for judicial candidates, for the 2012 General Election the Illinois State Bar Association determined Hon. Christopher Donnelly is not qualified for retention as a judge of the Circuit Court of Cook County for failure to complete the evaluation process. Hon. James Egan currently hears Motion Calendar X in the Law Division. He became a judge of the Circuit Court of Cook County in 1995. His previous assignments include the 1st Municipal District Traffic Court, 2nd Municipal District Criminal Court, and the Criminal Division. Judge Egan was retained for six-year terms in 2000 and 2006. Judge Egan did not submit documentation for evaluation for the 2012 General Election. Therefore, in accordance with its guidelines regarding judicial candidates, for the 2012 General Election the Illinois State Bar Association determined that Hon. James D. Egan is not qualified for retention as a judge of the Circuit Court of Cook County for failure to complete the evaluation process. Hon. Pamela E. Hill-Veal is currently assigned in the 1st Municipal District within the Civil Trial Section. 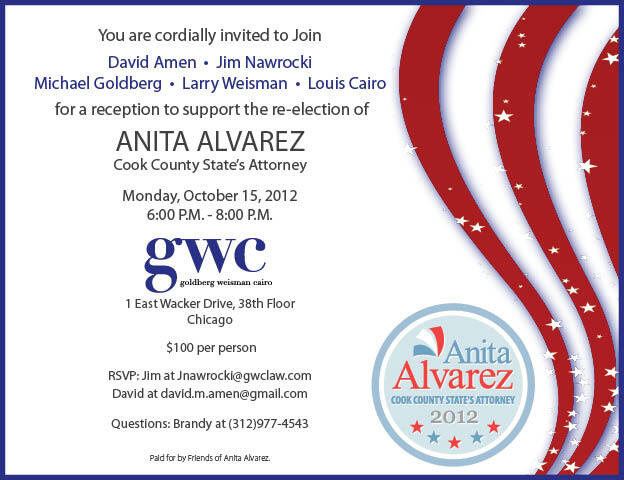 She was appointed to the Circuit Court of Cook County in 2004 and elected in 2006. Judge Hill-Veal did not submit documentation for evaluation for the 2012 General Election. Therefore, in accordance with its guidelines regarding judicial candidates, for the 2012 General Election the Illinois State Bar Association determined that Hon. Pamela E. Hill-Veal is not qualified for retention as a judge of the Circuit Court of Cook County for failure to complete the evaluation process. * As reported here yesterday, the Alliance of Bar Associations for Judicial Screening (of which the ISBA is a member) stated that Judge Egan told them that he was retiring in December and that this was the reason he would not participate in the screening process. According to the Alliance, however, because of a missed deadline, Judge Egan's name will still appear on the ballot and, under its rules, the Alliance was obliged to issue this negative review. It should also be pointed out that Judge Egan is not listed among the judges seeking retention at the Cook County Retention Judges website. Judicial retention elections seem strange to many voters. The nearly 60 judges up for retention in Cook County this year do not run against anyone; the candidate's name is on the ballot in the form of a question that comes down to this: Should Judge X remain a judge? Or should Judge X look for work elsewhere come December? If Judge X receives at least a 60% "yes" vote, he or she keeps the job. Past results suggest that the current class of judges have excellent prospects for success in this retention election; the last time any Cook County judges failed to achieve a 60% yes vote was in 1990, when seven judges were removed (though one was simultaneously elected to the Appellate Court). But that doesn't mean that judges have no reason to take retention elections seriously. It is a fact that at least two out of 10 voters will mark "no" on every single judge, no matter how qualified. In the 2010 retention election, for example, out of the roughly 70 judges on the retention ballot, only two Circuit Court judges received more than an 80% "yes" vote (Judges Sophia Hall and Carol Kelly, with 'yes' votes of 80.07% and 80.16% respectively). Thus, the stars of the newspapers' editorials, the individuals rated most highly qualified by all the various bar groups, can still expect to be rejected by 20% or more of the voters. Those inclined to 'throw the rascals out' will vote the retention ballot no matter what. Can we safely assume that the just-say-nay voters will number no more than 20 or 25% of the retention voters? Well, as a lot of people learned first-hand with their IRAs in recent years, past results are not a guarantee of future performance. But wholesale removal of judges in Cook County would not be in the public's best interests. We have many very good, hard-working, scholarly judges in Cook County. There will also be some judges on this year's retention ballot who, in the opinion of some bar associations, or some newspapers or community groups, should join the ranks of the unemployed. Usually, there will be some disagreement: Judge X may be rejected by one bar association, but recommended by another. It is up to the voters to educate themselves, in these cases, as to which bar association, or which newspaper editorial board, has the more persuasive view. I will try and report the good and the bad, the agreements and the disagreements, on various retention candidates in this blog. I mean to express no opinion about whether any particular judge should or should not be retained. But I do submit that the default vote on the judicial retention ballot, in the absence of a good reason to vote otherwise, should be "yes." The Alliance of Bar Associations for Judicial Screening has released ratings for candidates on this November's Cook County judicial retention ballot. The bar groups that together comprise the Alliance are the Asian American Bar Association of the Greater Chicago Area (AABA), Black Women’s Lawyers Association of Greater Chicago (BWLA), Chicago Council of Lawyers (CCL), Cook County Bar Association (CCBA), Decalogue Society of Lawyers (DSL), Hellenic Bar Association (HBA), Hispanic Lawyers Association of Illinois (HLAI), Illinois State Bar Association (ISBA), Lesbian and Gay Bar Association of Chicago (LAGBAC), Puerto Rican Bar Association of Illinois (PRBA), and Women’s Bar Association of Illinois (WBAI). Of the 58 judges listed below, there are only two judges who received negative ratings from each bar group, Judge James D. Egan and Judge Pamela E. Hill-Veal. Neither participated in the Alliance candidate evaluation. According to the ISBA's Joyce Williams, who coordinates judicial evaluations for the Alliance, Judge Egan advised the group some time ago that he would be retiring in December and, accordingly, he was not scheduled for interviews. Unfortunately, because of a paperwork snafu, Judge Egan did not get his name removed from the retention ballot in time. Because Judge Egan's name will be on the ballot and because he did not participate in the screening process, under Alliance guidelines, he automatically receives negative ratings from each member. Click on any image to enlarge or clarify. In a few cases you will note that one group or another has given a candidate a rating of 'NE.' That means that the candidate was not evaluated by that particular group. It is not a negative rating. The Alliance of Bar Associations for Judicial Screening has released ratings for candidates in contested judicial races on the November ballot. Each of the candidates in these contested Circuit Court races has a campaign website; links to their respective sites are in the blog sidebar. Cynthia Ramirez won her primary race for the countywide O'Brien vacancy in March. Although she faces no opposition in November, she does have a campaign debt to retire. Toward that end, a Ramirez fundraiser has been planned for October 11, from 6:00 to 8:00pm, at the law offices of Reyes Kurson, 600 W. Van Buren, Suite 909. Cook County Democratic Party Chairman Joe Berrios is hosting the event. Tickets are scaled at $500 (blue level), $250 (red level), and $100 (white level). To reserve tickets, or for more information, contact James Robinson at 312-332-0055. Retired Cook County Circuit Court Judge James F. Henry and the Friends for Ed Maloney are hosting a fundraiser for 4th Subcircuit judicial candidate Edward M. Maloney on September 24 from 5:00 to 7:00pm at Crown Imports, One South Dearborn, 17th floor. The minimum suggested donation is $100 per person, but tickets are $30 for country employees. Tickets will be available at the door. For more information about the event, or to reserve tickets in advance, email Maloney4Judge@aol.com. The Chicago Bar Association will sponsor a seminar, "Do You Want To Become a Circuit Court Judge," on September 27, from 12:00 to 2:10pm, at the Chicago Bar Association, 321 S. Plymouth Court. Among the scheduled speakers are Judge William Maddux, the Presiding Judge of the Law Division; Cook County Clerk David Orr; Associate Judge Mathias W. Delort (who will be sworn in as a Justice of the Illinois Appellate Court later this year); Associate Judge Thomas R. Mulroy; and Edward Austin, the immediate past chair of the CBA Judicial Evaluation Committee. Enrollment for the seminar (which offers 2.0 CLE credits) is free for CBA Advantage Members, $50 for other CBA members ($35 for government members), and $100 for non-CBA members. Further information about the seminar is available on the CBA website. Registration can be accomplished through the CBA website or by emailing seminars@chicagobar.org. 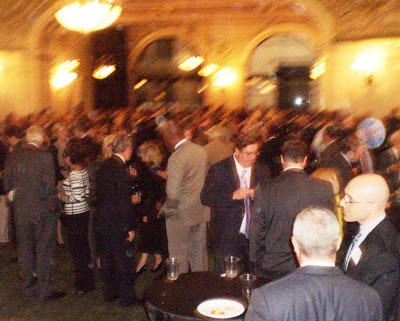 Preston Bradley Hall at Chicago's Cultural Center was filled to capacity Thursday night for the 2012 Retention Judges Reception. I'd like to tell you that this fuzzy, soft-focus crowd shot was really a skilled, arty composition, but that would not be true. Fortunately a few of the other shots I took came out better. Judge Moshe Jacobius, one of the nearly 60 judges seeking retention, was on hand to greet early arrivals. Judges Jean Prendergast Rooney and Alfred M. Swanson, Jr. Judges Joyce Marie Murphy Gorman and E. Kenneth Wright, Jr. Both are on the retention ballot. came out to support their colleagues. Tuesday night's Better Government Association Idea Forum was entitled, "Improving Judicial Selection: Are we ready for reform?" and, from the title alone, I attended with the full expectation that this would be a meeting of the Saved preaching the gospel of merit selection to the Already Converted. I was pleasantly surprised to find instead a frank and lively debate. Yes, ISBA President John Thies was on the panel and the ISBA has long been a supporter of judicial merit selection proposals, as President Thies noted in his opening remarks. And retired Appellate Court Justice Gino DiVito has long been an advocate of merit selection. But retired Cook County Circuit Court Judge Anthony Young, speaking for himself and, he said, for the Cook County Bar Association, was on the dais supporting the continued election of Illinois judges, especially from the subcircuits. There is no need to reform a process that isn't broken, Young said repeatedly. Judicial reform was achieved with the creation of subcircuits, Young said. A former state legislator, Young credits the subcircuit system with increasing diversity on the bench, providing many female, African-American, and openly gay judges. He argued that the creation of Cook County's subcircuits was a legislative reform and response to the scandals of Operation Greylord. Young objected to the notion that subcircuit elections have produced judges of inferior quality or ability, noting that many of the highest-ranking judges in the Circuit Court of Cook County were elected from subcircuits. Justice DiVito agreed that the Cook County bench is both strong and diverse, but "we have outstanding judges despite the way we select judges, not because of it." People guess when they vote for judges, DiVito said. The media, he said, is incapable of informing voters on judicial candidates' qualifications and the voters are not engaged. Opponents of merit selection, DiVito said, say they are concerned about giving people the right to choose their judges, but the right to choose is "illusory" where there are too many candidates and voters are making choices among them based on their names alone. Thies and DiVito said Illinois should adopt a merit selection process that depends on bi-partisan nominating commissions to minimize political influence on the process. In one proposed merit selection model, the Attorney General would appoint half the members of the nominating commission in each circuit (attorneys or lay persons) while the next highest-ranking statewide official elected from the other party would choose the other half of the members. Of course, in some years, there may be constitutional officers from only one political party; some arrangement would have to be made, in that case, to allow equal participation by the minority party. The commissions would certify three names to the appointing authority, whether that might be the Governor or the Supreme Court. Either way, the appointment would have to be made from among the three names certified. Thies acknowledged that such a system could be blended with continued elections of subcircuit judges if that were a matter of political necessity. Young insisted that subcircuits are small enough that a candidate can really go door-to-door, bypassing the political power structure and still winning election. DiVito was skeptical of this notion. Young suggested that nominating commissions might be able to pick out the best lawyers, but the best lawyers do not always make the best judges, just as the best baseball players do not always make the best managers. Michael Jordan, he added, was the greatest basketball player of all time, but Jordan has had great difficulty in picking talented players when he moved into ownership. Moreover, Young said, he was concerned that the selection of the nominating commissions would be highly political, and insulated from public input. While Young felt that judicial elections should be continued at all levels, DiVito pointed out that, in essence, half our serving judges in Illinois are already appointed. He referred, he said, to the associate judges, who are elected by the full judges in each circuit. Many of these, DiVito said, are "among the best judges we have." Moreover, he pointed out, many judges who win election first attain the bench by Supreme Court appointment to a vacancy. DiVito said appointed judges have an advantage in the electoral process (FWIW readers know that any such 'advantage' is inconsistent at best). 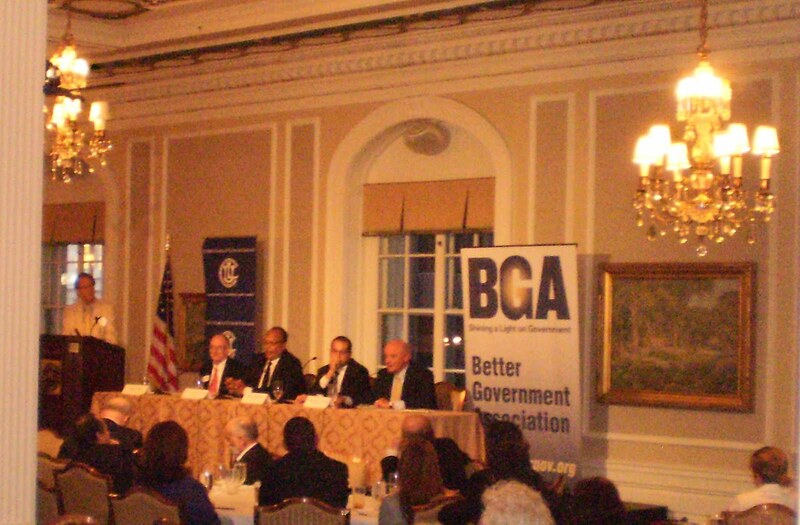 Host and moderator Andy Shaw, the BGA's President and CEO, steered the discussion into areas of financial reform and Brian Gladstein, the Executive Director of the Illinois Campaign for Political Reform, provided a truly jaw-dropping statistic. In a recent nationwide survey of sitting judges, Gladstein said, fully 35% of the judges felt that their colleagues' decisions were influenced by contributions received. Pause for Personal Opinion Clearly Labeled as Such: It's one thing if sore losers feel that way -- at least 50% of the parties in any given case will go away unhappy; such is the nature of litigation -- but if judges themselves begin to believe that their colleagues have indeed been corrupted by campaign contributions, we have a serious problem in this country. Citizens United v. Federal Election Commission was singled out by the panelists as a major obstacle to meaningful campaign finance reform. Thies noted, however, that the ISBA is working on a proposed change to the Supreme Court Rules whereby a judge's receipt of lawful campaign contributions, when combined with other factors, might result in mandatory recusal in a given case. Thies explained that some judicial candidates are very careful to avoid finding out who has contributed to their campaigns, thereby avoiding any possible influence. Other candidates, just as ethical, want to know about every contributor, so that the campaign can return any contributions from any questionable source. Young said he did not believe changes in campaign financing laws were necessary because the men and women who run for the bench are honest and upstanding persons; on the other hand, he could support a public financing provision at the Supreme Court level to avoid the appearance of impropriety. Gladstein noted that in other jurisdictions -- he singled out New York -- public financing supplements or matches private donations in judicial campaigns, sometimes on as much as a 6:1 basis. DiVito said that the very fact that judicial candidates must raise money is a strong argument against the current electoral system. The evening concluded with Shaw asking the panelists how the present system may be improved. Discussion focused on different ways of getting information about candidates to the public. FWIW was not mentioned. ICJL joins call for judicial election reform. Not all the Cook County judges seeking retention this November have yet posted biographies on the Cook County Retention Judges website, but many have and more are sure to follow. That's a link to the site in the preceding sentence; the accompanying graphic was taken from the site. I've also added a link to the site in the Sidebar. In other retention election news, the Alliance of Bar Associations is expected to release its ratings for each of the 60 judges seeking retention later this week, perhaps as soon as tomorrow. I'll be posting that information here as well. The Chicago Bar Association ratings for the retention candidates is expected before the end of the month. When available, those ratings will be posted here as well. Edward M. Maloney and Terry Gallagher, Democratic nominees for the 4th Subcircuit "A" and Riley vacancies, will hold a joint fundraiser on Sunday, October 7, from 2:30 to 4:30pm, at Kenny’s Pub, 917 W. 55th Street, Countryside. Tickets (for $75 each) will be available at the door. Appetizers, beer and wine will be provided and, yes, the Bears-Jaguars game will be on the TV. For more information about the event, or to pre-order tickets, email gall784@gmail.com.